Sushi Roku, the popular Los Angeles-based sushi concept, will be making its Orange County debut June 1, when it opens its doors in Fashion Island. As the name suggests, the venue will be serving up sushi and sashimi, along with an eclectic array of specialty rolls. The menu will also feature modern Japanese fare created with a California influence. Guests will be able to round out their dining experience with a selection from the venue’s beer, wine and sake list. Lunch & Dinner daily. Sushi Roku Newport Beach, Fashion Island, 401 Newport Center Dr. Ste 327, Newport Beach, CA 92660, no phone. SOCIAL Costa Mesa hosts special Sunday Supper menus. Executive chef Jeffrey Boullt taps into his Southern roots by crafting a hearty weekly menu that emphasizes flavors and ingredients from the region, such as Cajun-style fried chicken and ham and cheddar biscuits. Bar director Mike West will also be creating fresh craft cocktails to pair with the dishes. 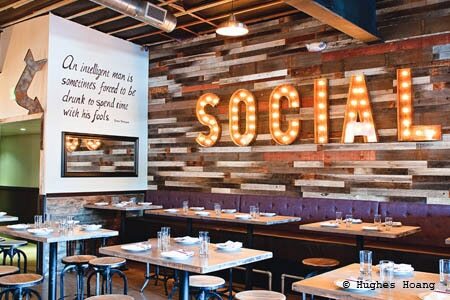 SOCIAL Costa Mesa, 512 W. 19th St., Costa Mesa, CA 92627, 949-642-2425. Executive chef Vincent Lesage has departed the Balboa Bay Resort in Newport Beach. The chef, who had taken the helm from longtime resort chef Josef Lageder last year, has accepted a position as executive chef as the resort’s sister property, Bacara Resort & Spa in Santa Barbara. Rachel Haggstrom, who was Lesage’s chef de cuisine, has officially been appointed as the property’s new executive chef, where she will oversee its two main eateries, Waterline and A + O Kitchen & Bar. Waterline, Balboa Bay Resort, 1221 W. Coast Hwy., Newport Beach, CA 92663, 949-630-4145. Charlie Palmer’s at Bloomingdale’s South Coast Plaza closed its doors after a seven-year run. The restaurant had been one of the culinary flagships of the famed Costa Mesa shopping center. It will be replaced with gourmet burger concept Holsteins Shakes and Buns. The new eatery, whose original location is in The Cosmopolitan Hotel & Casino in Las Vegas, is slated to open in August 2015. Charlie Palmer's at Bloomingdale's South Coast Plaza, South Coast Plaza, 3333 Bristol St., Costa Mesa, CA 92626, no phone.